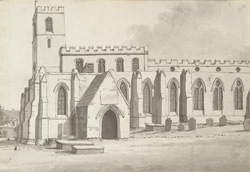 "The parish church of St. Michael, at the top of High street, is probably the third church to occupy this site, it being supposed that the first church stood there in 925-940. The present church was originally built in the 12th century, but has undergone great structural alterations...there is some good carved oak in the chancel, and in the west porch lies the fractured and mutilated effigy of a knight in armour, girt with sword and dagger; this figure, which represents Thomas Middleton esq. of Chevelingham, Northumberland, ob. circa 1400, once lay on an altar tomb in the north aisle, but the tomb was broken up on the rebuilding in 1807: the communion plate includes a cup dated 1574, and two others which are used as patens and are dated 1608 and 1718 respectively: the church has been restored since 1873, at a cost of £4,800, and affords 1,500 sitting." Extract from Kelly's Durham Directory (1914).